Sometime after the birth of my first child, I realized just how much I needed a supportive community to cushion, support and teach me, and how much I wanted this same community so I could share, celebrate and contribute to the growth of families around me. We spent some time investigating existing and forming communities in the Seattle area, but didn’t find one that was a good fit. We waited a couple of years, and then after the birth of our second child, we embarked on a three week tour of the New England to visit various established and forming communities. The only community that seemed right was too far from Lance’s family, so we ruled it out, and decided to move back to the town where his family lives. We hoped that by surrounding ourselves with family we could find community. They were wonderful, but we were exhausted by the reality of living in rural New England; our days were spent in the car driving, driving, driving on winding roads that made our children nauseous and left me weary. Nine months after moving, we were lured back to Seattle by Lance’s former employer. A three month contract led us to a home purchase in the community-rich Phinney-Greenwood neighborhood. Since moving here three years ago, we have consciously tried to involve ourselves in our neighborhood. We are fortunate to live in a neighborhood where many amenities are accessible on foot. Walking to the library, post office, book store, yarn store, bank, barber shop, grocery store, coffee shop, preschool and farmer’s market turns familiar faces into friends. 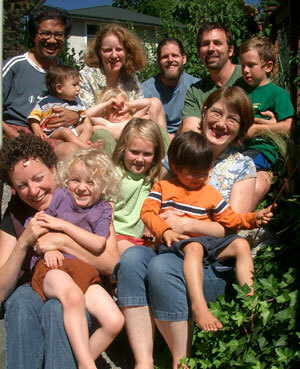 However, when some friends were forced to look for new housing options, the subject of cohousing came up again. Pretty soon we had committed to forming Seattle City Cohousing with the stated goal of building an urban intentional community in North Seattle. Our group of three families has been meeting bi-weekly since June as we are committed to expediting the process as much as possible. Ultimately, we hope to have twelve families in our community as the wisdom of elders states this is the ideal number to balance the ability to resolve conflict and still maintain connections. It is with some trepidation that I embark on this project because I am keenly aware just how much work goes into this sort of effort, far beyond the nitty gritty of finding a property and creating our dream homes. There is also some reluctance to leave our home and neighborhood, but the lure of living with souls I cherish is just too strong. Our children have so much to gain from growing in the company of many adults who nourish and treasure them, and I have so much to offer to generations of children who will come through our community. What a wonderful idea. Good luck to you all! Good luck. 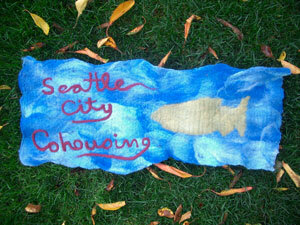 There is a great co-housing community down the road from us. I think community is so important–it is becoming a huge consideration for us as we search for the right high school for our daughter–the super cool private school with yurts 25 minutes away? The medium good public high school in the community? Good luck with the co-housing project. I know what work it will be, but so rewarding. ps: we went to the wool room in Antrim, NH last weekend? Have you ever been there? We just discovered it, and it is our most favorite wool spot! Always nice to find out new layers to friends – I love and admire what you guys are doing. Here is wishing you the strength to achieve all of your dreams and the opportunity to find balance in it all. Wow, Leah. This is such a great idea! I really hope you will keep us up to speed on the project, and provide tips to others (like me! )who might be interested in doing something similar in the future. You have put into words so well that which I knew I had when I did have it years ago, and that which I definitely knew I didn’t have at times. (That’s a bit convoluted, I know) I look back on the times when our boys were little and remember when we had that community and to those painful times when we didn’t. I just didn’t have a Name for it then. Your post has helped me to be gentler on myself when I have those remembrances of such struggles to find a Home, a circle of Comfort and a sense of Belongingness and Purpose. I always thought it was me who was deficient and out of whack. Thank you. I know that you and your family will find the Way and the Place. I’ve discovered your blog not too long ago, and I’m glad I did! I’m getting into felting, and this is what led me here. But now, since integrating an intentional community is an idea I’ve begun exploring, I’m also extremely interested in the cohousing project you’re embarking in. I’ve read Diana Leafe Christian’s book “Creating a Life Together: Practical Tools to Grow Ecovillages and Intentional Communities” a little while ago, as you certainly have too – it is a great resource. Following your journey into the establishment of a cohousing project would be a wonderful complement to that resource. So I hope you will be keeping us updated as things progress: I’d really love to read more about your experience in establishing this intentional community.